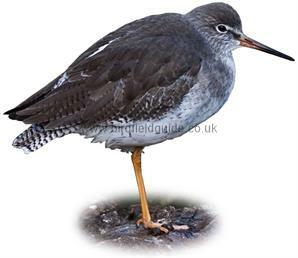 In winter the Redshank has dark brown upperparts and head, it's underside is dull white and it's breast is greyish-brown. It has a black bill which is orange at the base. It's legs are orange. The Redshank is a bold noisy bird, especially around breeding sites where it becomes easily agitated by unwanted visitors. 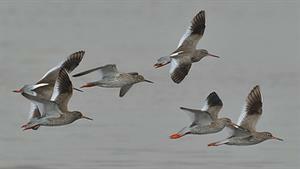 Note the dark wing tips, bright red legs and extensive white on the wings, Redshank in summer plumage. Breeds throughout most of Europe where it also winters. 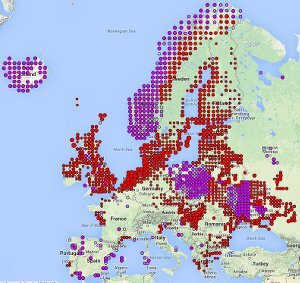 Most birds move slightly South in winter but some birds are resident. Some non-breeders winter further South, as far as Northern Australia. Widespread in the UK, especially in winter when numbers are increased by migrants. Breeds on salt marshes and wet pasture near freshwater, sometimes on wet upland moors. In winter birds move to muddy estuaries and creeks, often forming large flocks. Redshank in summer plumage near it's nest site. 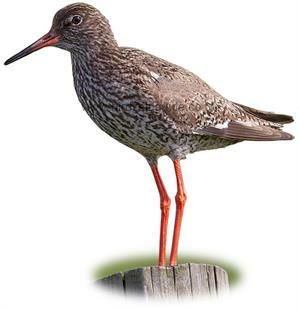 The Redshank in summer plumage is a beautiful bird, bright red legs, dark speckling and bold character make it a distinctive wader. 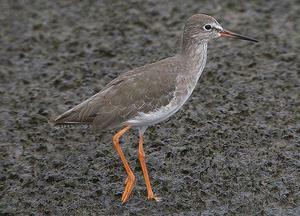 The bright legs are usually the first clue to identifying the Redshank, even in winter they are still striking.